Four guys in their late twenties/early thirties live in a singles apartment block in Miami. Larry ‘Fuzz-O’ Dolman is an ex-cop who now works for a private security company. Eddie Miller is an airline pilot who’s studying for a real estate license. Don Luchessi is a salesman, separated from his wife, but pining for the company of his ten year old daughter. Hank Norton is a smooth talking drug company rep who claims to be able to pick up a woman in any locale. They spend their free time hanging by the pool, playing cards, going to the movies and trying to chat up women. When Hank bets the others that he can pick up a woman from what they agree is an impossible scoring location - a drive-in movie theatre - he sets in train a whole series of events, starting with trying to dispose of two bodies. All four guys love Miami, but can they take the heat? 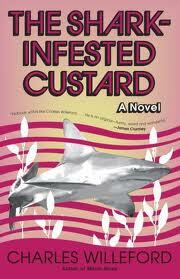 The Shark Infested Custard is told in four parts, each part told in the first person from the perspective of one of the four lead characters. Willeford manages to produce four different voices and to provide a nice depth of characterization. The dialogue is spot-on, and the scenes are well penned, some of them very well so. There are some very nice observational touches throughout, especially Hank’s amateur psychology readings of other people, although this is tempered by some fairly explicit sexism and some political incorrectness around race. For me, it was the plot that was the weakest element of the book. Each part is an extended short story, with each intersecting with the others. In some places, the story didn’t really seem to be moving anywhere other than building the character. There just seemed to be little forward momentum and if I’d lost the book, I wouldn’t have felt compelled to buy another to find out how the book ended. And collectively the four parts didn’t seem to be adding up to more than the sum of the parts. That is, until the last few pages. Often novels seem to tail off at the end, whereas this one finished with a flurry that had the effect of lifting the whole book. Indeed, it is interesting that a day or so after finishing it, my opinion of its merits is much higher than when I was actually reading it. Overall, an uneven story that has some flashes of brilliance. Willeford thought this was his masterpiece. I liked the Hoke Mosley books the best. Miami Blues, New Hope for the Dead, Sideswipe. Oh, and Pick-Up is very different and good.